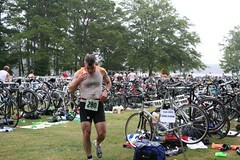 Yesterday, Jenn and I participated in the 2008 Peachtree City Triathlon. This was our second running of this race. Overall, it was excellently organized and run1. There were 1,100 racers with all their equipment packed into the park next to the Peachtree City Library at Drake Lake. Due to injury, I did not race the entire race, only the swim and bike legs. I walked the 5k. Jenn turned in an excellent time, especially in the swim where she overcame some major obstacles to set a personal record. We had a good time. You might be wondering about the image that is heading up this post. 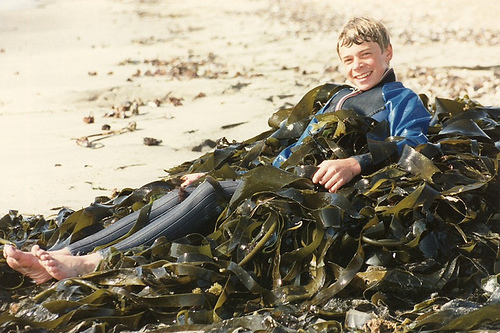 Let’s just say that the lake was a bit weedy. I was pulling lakeweed off of me from the word go. Yuck. Check out this image and this image in my flickr set to see how mucky the lake was. Courntey and David came with us to cheer us on and take pictures, thanks guys! 48:18 run (5 km) A personal record! Slowest 5k evah! Obviously not a stellar performance, but I’m happy with it. My leg is doing better and I didn’t hurt myself and throw off my marathon training. The next triathlon on the schedule will be an olympic sometime in the spring. Perhaps right back here in Peachtree City. I’ll be training for Ironman Florida at that time. 1I have a small beef with the race organizers, which I’ll be sharing with them. The race packet doesn’t include an information booklet. By itself, this is fine; I understand that they are going as green as possible. Eliminating paper is a noble start. But please please please, include the start time of the race in the packet. Yes, I know we can look that up ahead of time, but there’s nothing like picking up your number and chip, getting back to the hotel and then thinking, “Oh my god, what time does the race start? Is it 7:30? I think so, but am I sure. For the sake of my friendship with Jim, who has answered the phone and looked this up twice now, I implore race directors to include this information. Niiiiice, I am training for my first tri in Oct. I have much to learn and at 45 learning new things is getting harder. drop me a line some time. Sure Tom. I’d be delighted to discuss.